Now that we have the paginators behaving with the same underlying code there has arisen some issues with the optional variables each paginator can use. - Some places using limit per page from the get_account_preference($USER->get('id'), 'viewsperpage'); variable while other are set to the default 10 per page. Numbers are not displayed sequentially when viewing. Please see the attached screen shot. Robert I forgot to mention that the issue I reported above is present in all the pagination pages I have been looking at in bug number 1515484 and definitely sure it's present elsewhere that I haven't seen. 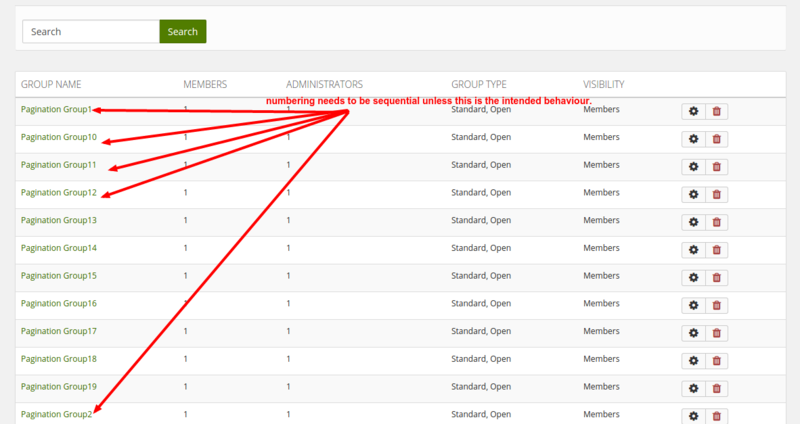 Ah that issue is not to do with pagination but more with how we sort results coming out of the database. The issue is they are sorted by title, which is a string, so the number at the end of the string eg 1, 2 3 etc. are treated as part of the string. So Pagination Group 14 comes before Pagination Group 14 due to alphabetical sorting and not natural sorting as expected. There are ways to achieve natural sorting but the main problem with them is they either need the string to have some predictability - eg position/length of integer to be predictable or to have some sql function added to the database, neither of these options are acceptable.